Glass and aluminium balconies with a ‘Wow factor’ are enabling residents and diners to make the most of scenic views on the island of Jersey. Effi Wolff of Balcony Systems Ltd showcases some examples installed by St Helier-based Pallot Windows, their distributor in the Channel Island of Jersey. 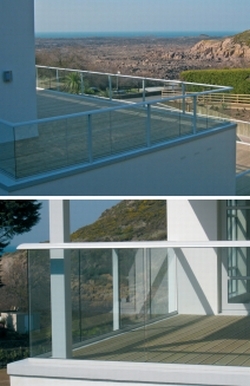 From beachside apartments to a fast food restaurant, Jersey has enthusiastically embraced the arrival of a low-maintenance glass balcony system that offers safety and security, while keeping clear views to the outside. 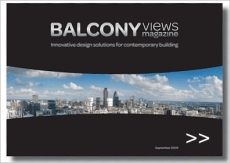 According to Tom Matthews, Managing Director of Pallot Windows, one of the isrand’s oldest window companies, the elegance and simplicity of the competitively-priced Balcony System serves their niche market perfectly. A shortage of homes is keeping Jersey’s builders busy, with some 400 new apartments a year being built – many on reclaimed or previously-developed land – to meet demand. Changes in the hotel industry mean a number of hotels are being converted into luxury apartments, many with large balconies with glass balustrades. 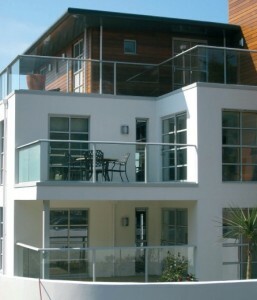 For example, the former Seacrest Hotel site at St Brelade has been transformed into eight apartments with glass balconies measuring up to 20 metres by 10 metres. As well as retaining spectacular sea views, the clear glass panels also offer protection from sea breezes. 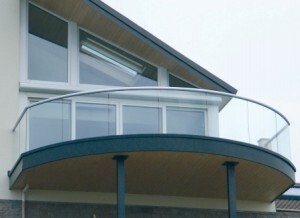 Similarly, shelter was a key factor in another project at a pizza restaurant overlooking St Brelade’s Bay. By using taller panels to create a seven-foot high glass ‘division’ screen, diners and smokers can enjoy the ocean vista from behind a clear ‘windbreak’. As inherently strong materials, glass and aluminium open up exciting creative design possibilities for straight and curved glass balconies, with minimal need for vertical or corner posts. Handrails are available in a choice of finishes to suit property styles and colour schemes; powder-coated white or anodized silver, bronze or ‘Royal Chrome’, which replicates the look of stainless steel, but without the discolouration problems. This entry was posted in Projects on January 26, 2014 by Nesia Sadeh.